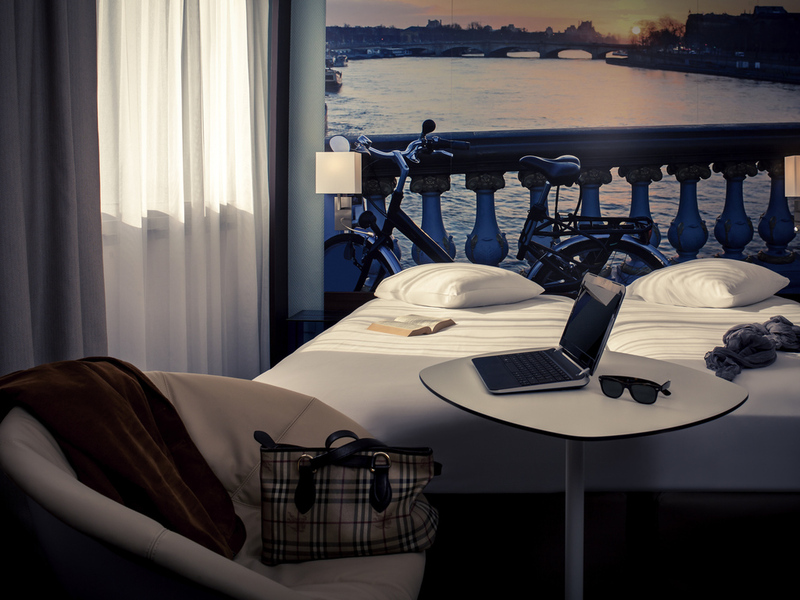 The Mercure Paris Ivry Quai de Seine hotel invites you to relax at the hotel bar and enjoy one of our 152 rooms. Close to Paris and with a free car park, this hotel is perfect for families wanting to discover the French capital. Situé à Ivry sur Seine, le Mercure Paris Ivry Quai de Seine est parfait pour un séjour d'affaires ou en famille. l'hôtel offre 152 chambres spacieuses, insonorisées, climatisées et avec wifi gratuit. Il compte 10 salles de séminaire, un restaurant (Ouvert du lundi au vendredi midi), un bar, une boutique gourmande et un parking privé gratuit. Son emplacement garanti un accès rapide aux gares d'Austerlitz, Paris Gare de Lyon et Bercy via la ligne de bus 24 et la gare RER d'Ivry sur Seine. Come and enjoy the shows and matches at the Palais Omnisport or Paris Bercy or visit the exhibitions at the Grande Bibliothèque. The location of this Mercure hotel is suitable for both business and leisure stays. Bibliothèque / Ch. de Vincennes : Bus 325 P. Vaillant Cou. Villejuif-L.Aragon/Charenton E. : BUS 180 P. Vaillant Cou. Choose from our different rooms to suit your taste: Superior with a new bathroom concept, Standard with double bed or twin beds or the Privilege Room with its range of complementary services. There is gourmet cuisine on offer at the "L'Allée" restaurant. Come and enjoy a drink from the "Cave et Saveurs" menu in the intimate atmosphere of the "Le 5" bar, open every evening. Our bar "Le 5" offers an intimate and cozy atmosphere. Come and enjoy a drink from our "Cave et Saveurs" menu.